Center-Harbor NH has just over 1000 year-round residents, according to the State of NH statistics in 2009. 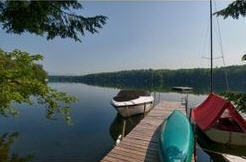 Center-Harbor NH has about 3 miles of shoreline on Big Squam Lake and 1 mile on Lake Winnipesaukee. With town beaches on both Squam Lake and Lake Winnipesaukee, Center Harbor offers its residents easy access to two of the most beautiful lakes in New England. Popular destinations in Center Harbor include the Waukewan Golf Course, the Town of Center-Harbor tennis courts and baseball field, and many winding walking paths through the conserved land, including the 157-acre Chamberlain-Reynolds Memorial Forest, Belknap Woods, and the Dane Forest. Center-Harbor also has the Squam Lake's Great Island, Duck Island and Kimball Island. Moon Island, located in Holderness, is in conservation and owned by the Squam Lakes Association, and can be easily accessed from Dog Cove in Center-Harbor. Aside from the closing of Belknap College and the Center-Harbor two room school house, the development of Senter's Market, the building of a bandstand for Friday summer concerts, and most recently, the residential development of some of the downtown Winnipesaukee shoreline, Center-Harbor has seen little change. Center-Harbor was the location of the Squam Lake cottage in the film "On Golden Pond". That location and the sweeping views of Squam Lake from Center Harbor Neck are only two of the sites that make Center-Harbor one of the most scenic towns in all New England!